I’m Scott. Art and Daniel are friends and sincere partners in faith. Ritch is my younger brother (he would say much younger) which does not necessarily mean that he and I can’t be friends and sincere partners in faith. 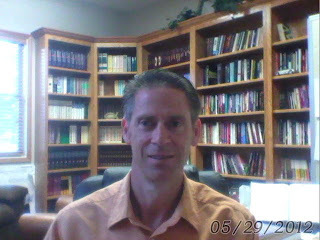 I serve as the senior pastor at East White Bible Church in Carlock, Illinois. I love our church because she reveals so much beauty as the bride of Christ. My precious wife, Carol, and I have been married for 31 years. We have three grown sons, two daughters-in-law, one grandson, and a grandbaby on the way. I’m looking forward to this blog because while Art, Daniel, Ritch, and I think alike about many things (and all the important things), we each have a way of expression and even of thought that is different enough that our dear readers will get a more fully orbed perspective than if only one contributor participated. My goal in this blog is to get famous and be asked to write incredible best selling books. This will enable me to quit my day job and be one of those famous “former” pastors who only have to prepare one sermon every 4-6 months or so and be regarded as an “amazing” thinker and man of God as well as a well compensated conference speaker. Not really—I just want to see if anyone is still reading this. What I really want to do is to point people to the Bible as our authoritative guide for how to think and how to live, to reveal the Gospel of grace as the only means to salvation and holiness, to grow in Christlikeness by interacting with my three brothers, and to reveal the joy of abandoning all I have for the kingdom of Jesus Christ. Is blogging a good thing or a bad thing? So, I guess if I'm arguing for or against blogging on the basis of youtube videos...it's a mixed bag. At the end of 2006, Time magazine published an issue celebrating the way in which the internet (and blogging in particular) served as a great equalizer. Millions of people now had the ability to make their voices heard. They could publish their thoughts on the latest geo-political development. They could express their support or opposition to an upcoming piece of legislation. They could download a video of their grandmother slipping on the wet pavement and falling into a vat of chocolate. Franklin's extraordinary persona informed what he wrote but was not the subject of what he wrote. Paine was perhaps history's most consequential pamphleteer. There are expected to be 100 million bloggers worldwide by the middle of 2007, which is why none will be like Franklin or Paine. Both were geniuses; genius is scarce. Both had a revolutionary civic purpose, which they accomplished by amazing exertions. Most bloggers have the private purpose of expressing themselves for their own satisfaction. There is nothing wrong with that, but there is nothing demanding or especially admirable about it, either. They do it successfully because there is nothing singular about it, and each is the judge of his or her own success. Nevertheless, I’m excited to tread into the blogging waters with my fellow pastors. Ritch, Art, and Scott are dear friends. Each of them have had a significant impact on my walk with the Lord and my ministry. I’m confident that the three men who are joining me in contributing to this blog—and others who will be contributing occasionally—will be a great resource for your spiritual edification. I’m confident that I will grow as I read the posts of the other men. Far from pursuing a running narrative about themselves, I'm excited as the bloggers here pursue exalting Jesus Christ. Even though I run the risk of “expressing myself for my own satisfaction,” let me share just a few things about myself by way of introduction. My wife, Whitney, and I have been married for almost thirteen years and have four wonderful children. 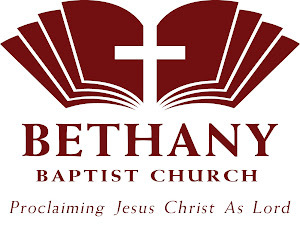 I’ve been on staff at Bethany Community Church for almost four years and, prior to that, was on staff at Bethany Baptist for eight years. Today as I was cleaning my office, I found a copy of my ordination certification. I glanced at the portion of the certificate where the men who had served on my ordination council signed the document. The first three names on the certificate? Ritch Boerckel, Scott Boerckel, and Art Georges. These men were instrumental in helping me begin my pastoral ministry and I'm excited they will help me continue to grow in it. I own a Grandfather Clock that I haven’t used for some time now. We bought it years ago, when we had no sleeping babies in the house; we stopped winding it (or whatever you call what you do to keep the thing going) when we had more sleeping babies. As it stands in the corner of our family room, it reminds me of the adage “a broken clock is right twice a day”. Whatever place the hands of the clock stopped at when we ceased using it, they render our clock accurate twice in each 24 hour period, when the actual time coincides with its frozen time markers. It would be foolish to use a broken clock as one’s source of time-truth, for it would be wrong 23 hours and 58 minutes out of 24 hours. That is a 99.9% inaccuracy. In fact without an accurate source of time keeping, the two minutes per day it was spot-on would be unknowable! In order for a broken clock to be useful even for two minutes, one needs an accurate source of time, a clock that represents truth. As I thought about this, it caused me to think about truth, our society, and the times in which we live. More and more, it appears that the mechanism of our culture is broken, and yet like a stopped clock, we still get some things right, there is enough of a focus on morality and ethical matters, such that it appears we are right at least twice a day. Yet, the only reason we might assess some measure of moral rightness is because we still have the voice of truth, God’s truth, as our basis of comparison. Are we, as God’s ambassadors, the Christian community of Bible-believing followers of Christ, going to be satisfied with such gross inaccuracy and unwilling to herald the true time that the clock should mark? I trust that your answer is the same as mine, “No!” Yet, as we proclaim God’s truth, exposing great dissonance between truth and belief systems prevalent today, we must do so with gentleness, reverence, and compassion. We must trust that for some, the gentleness in our answer can help to turn away the wrath that often accompanies the shame and guilt of exposed sin, whereas harshness in our words is sure to stir up anger, unnecessarily. My hope is that my own contribution to this blogging effort will force me, and help others, to think through some issues that the Christian faces in living by faith in a world that does not encourage doing so. I have never considered blogging before because I am never so confident that my own thoughts are of great value to others. But, by the request of my colleagues and by virtue of the responsibility of my calling as a shepherd, I do embrace this effort as something that the Lord might use to help the saints in our efforts to glorify Christ. Jesus prayed that our heavenly Father would set us apart from the world we live through the study and practice of God’s truth (John 17:3). Please know as you read my contributions that, while I have been gloriously saved by God’s grace through faith in the atoning work of Jesus Christ, I am a work in progress. My mind is an integral part of that process as I renew it through study and meditation of the truth of God’s word. Join me in that endeavor!